Marketing in the Digital Age is a four-day course being conducted by the Rausing Executive Development Centre at the Lahore University of Management Sciences [LUMS] from 23rd to 27th February. 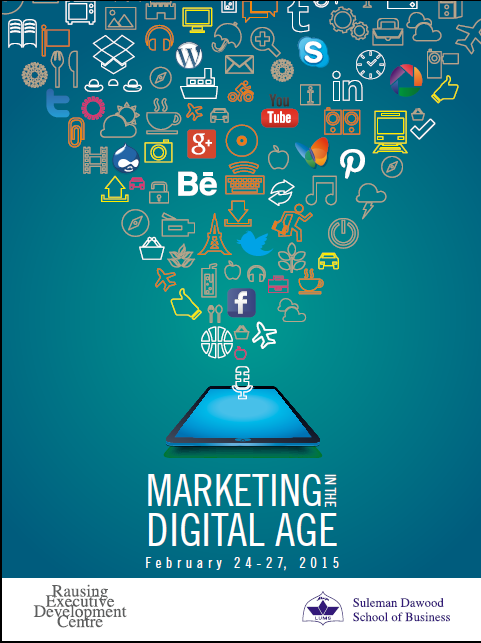 This is the second time around LUMS is conducting the ‘Marketing in the Digital Age’ course. There’s not much feedback available online about how this course fared the first time around. If you Google it, the top 10 results almost all of them pertain to the content being put online either by the REDC [ Rausing Executive Development Centre] or by Dr. Farrah Arif, the programme director herself. Even if you dare to go to the second or third page of Google, you would be hard pressed to find any independent review of the programme. Which is quite strange considering some of the movers and shakers of the corporate world must have attended this course. What Dr. Farrah Arif herself have put out in the digital sphere is a slideshare presentation giving the programme details and a video intro to the course on Daily Motion. It would be interesting to see whether the course is academic in nature which revolves around solving Harvard Business Case Studies or has relevance to the Pakistan’s digital sphere as well.